Santone's Lake Fork Braid Buzz is the first buzzbait specifically designed to use with braided fishing line. 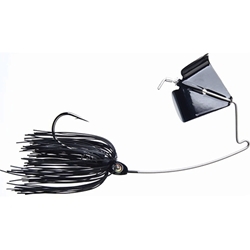 This buzzbaits features a curve in the wire which allows for the bait to ride lower in the water for better hooks while still remaining weedless. The Braid Buzz comes with an oversized screw lock to hold any trailer in place and an extremely durable .060 Musky-size wire for big fish and heavy cover.